Memorial Park sits on 11 hectares of land next to the Tauranga harbour between 11th and 7th Avenues. The park features include a water fountain, Humpty Dumpty, cenotaph, swimming pools, a miniature railway, the Queen Elizabeth Youth Centre and Memorial Hall. Researched by Debbie McCauley. Maori inhabited the high land surrounding Memorial Park before the arrival of Europeans. Memorial Park is located at the corner of Devonport Road and 11th Avenue and lies in close proximity to the centre of Tauranga City. The Park is bounded by 7th and 11th Avenues in the north and south, Devonport Road to the west, and finally Tauranga Harbour to the east. Taiparoro - was the high land between Arundel Street and 6th Avenue, facing Devonport Road. Taiparirua - the high land between 7th Avenue and 9th Avenue, going on to Devonport Road. Riri iti - was referred to as the hill at the east end of 11th Avenue, overlooking the harbour. Hawaii - was referred to as the beach that extends along in front of Memorial Park. 1838-1839: Te Papa land purchase by Alfred Brown on behalf of the Church Missionary Society (CMS). 1866: CMS gifts much of the Te Papa block to the Crown. 1906: A bowling green is formed on the corner of 6th Avenue and Devonport Road. 1922: First attempt by the Tauranga Borough Council to take land between 6th and 11th Avenues for recreation purposes. 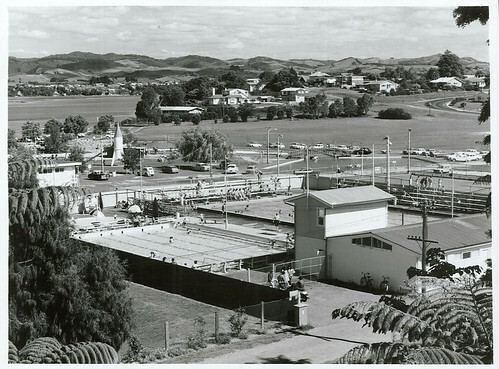 1925: Taiparirua Bowling and Tennis Club opens on 2 acres of land between 7th and 9th Avenue. 1936: Land purchased from the estate of Eleanor Jordon (widow of Canon C Jordan) - Jordan Field (used as a camping ground over summer). 1940: Treaty of Waitangi centennial celebrations saw Coucil in interest in forming a 'Centennial Park'. Bowling club moves to Tutchen Street. 1942: Land purchased from AGP Wallace. 1945: Name changed to 'Memorial Park' in order to access the governments pound for pound subsidies for war memorials to those killed during the war. 1946: Land purchased from Ruby Ashurst, Ida Munro and Pierre Guillard. 1950: Land purchased from EG Fox. c1951: Memorial Park World War Two Cenotaph built. 1952: Rugby and playing fields developed. 1953: Land purchased from Tauranga Co-operative Dairy Association. 1954: ﻿Soundshell at Memorial Park opens (20 000 Club). 1954-1955: The end of 8th, 9th and 10th Avenues are closed from Devonport Road to the sea giving more land to the park. 1955: Land purchase - final section from the Church Missionary Society (CMS) block. Memorial Park swimming pool opens. Prior to this the 'baths' were a portion of the harbour at the bottom of 1st Avenue where swimmers were protected from sharks etc by a barnacle encrusted fence of railway sleepers that caused many grazes. 1957: Memorial Park Hall opens (architect Norman J Jenkins). Skating rink built and skating club formed. 1959: Onna Joustra designs a children's playground for Memorial Park that is submitted to a Borough Council competition by the Tauranga Jaycees. The playground includes a rocket slide, Humpty Dumpty, a locomotive, a tractor and a roundabout and is officially opened on 19 December 1959. 1961: More land purchased from the Tauranga Co-operative Dairy Association. 1962: Jaycees Illuminated Fountain switched on by Mayor David S Mitchell with it's 260 jets and coloured top and bottom lights. Junior swimming pool opens. Old Harvard installed in children's playground. 1965: Foundation stone of the Queen Elizabeth Youth Centre laid by Governor General, Sir Bernard Fergusson. 1967: Queen Elizabeth II Youth Centre opens in March. Jaycees Marina opened, a shallow pool with paddle boats, canoes and rowing boats. The Marina won the Alfred Eady Award No. 1 for the best Jaycees project in New Zealand and later the best chapter project worldwide. 1969: The level of the sportsfield is raised one metre due to drainage problems. 1975: Covered seating installed for the Soundshell. 1981: The swimming pool is heated. 1983: 300 metre miniature train track opens built by the Lions Club. Playground locomotive given to Motat. Mini-putt course opens. 1985: Soundshell demolished. Newly painted Memorial Park mural by Vikki Hamilton is vandalised. The mural covered a water tank near the swimming pool. 1986: Planning consent granted for Tauranga Rowing Club Rooms and public toilets on the foreshore. 1987: Jaycees fountain repaired. Skateboard ramp opened. 1988: In April Humpty Dumpty is subject to a savage bottle attack, his smashed body is found surrounded by soggy paper-mache and broken beer bottles. Paddle-boat marina demolished in August 1988. 1989: A bronze sundial atop a small cairn is unveiled to mark the centenary of the Institute of Surveyors and to recognise the work of pioneer surveyors in Tauranga. 1990: War Memorial built at the south east corner of Memorial Park. Opens on Armistice Day. 1993: Memorial trees planted to commemorate the 75th anniversary of Armistice Day. 1994: Humpty Dumpty vandalised again. 1995: Memorial trees planted to commemorate the 50th anniversaries of VE and VJ Days. Bellamy, Alan Charles (1982). Tauranga 1882-1982 (p. 277). Smith, Ken (May 2015). 20,000 Onwards: Our War Memorial Park takes shape. In Historical Review: Bay of Plenty Journal of History (Volume 63, Number 1, pp. 25-26). Tauranga City Council (December 2006). Memorial Park Management Plan. Tauranga City Libraries Vertical File: Parks and Reserves, Memorial Park.